Port Blair is known for historic sites, nature, beaches, wildlife, and museums. Your plan includes some of its best attractions: head off the coast to Ross Island, steep yourself in history at Cellular Jail, pause for some photo ops at Rajiv Gandhi's Statue, and examine the collection at Anthropological Museum. For ratings, traveler tips, reviews, and tourist information, read our Port Blair tour itinerary planner . New Delhi to Port Blair is an approximately 5-hour flight. While traveling from New Delhi, expect little chillier days and a bit warmer nights in Port Blair, ranging from highs of 35°C to lows of 35°C. Finish your sightseeing early on the 2nd (Mon) to allow enough time to ride a ferry to Havelock Island. On the 3rd (Tue), enjoy the sand and surf at Kalapathar Beach and then kick back and relax at Radhanagar Beach. To see maps, reviews, photos, and more tourist information, use the Havelock Island online itinerary planner . Traveling by ferry from Port Blair to Havelock Island takes 3 hours. Finish your sightseeing early on the 3rd (Tue) to allow enough time to travel to Neil Island. Kick off your visit on the 4th (Wed): snap pictures at Howrah Bridge and then enjoy the sand and surf at Bharatpur Beach. To find reviews, ratings, photos, and tourist information, read our Neil Island day trip planning tool . 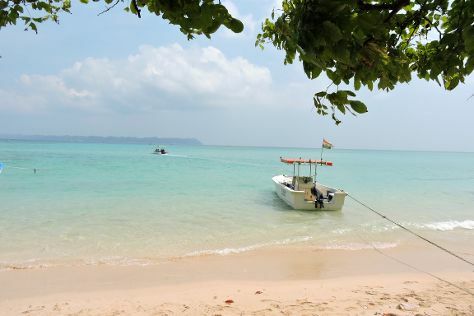 Explore your travel options from Havelock Island to Neil Island with the Route module. On the 4th (Wed), wrap the sightseeing up by early afternoon so you can travel back home.